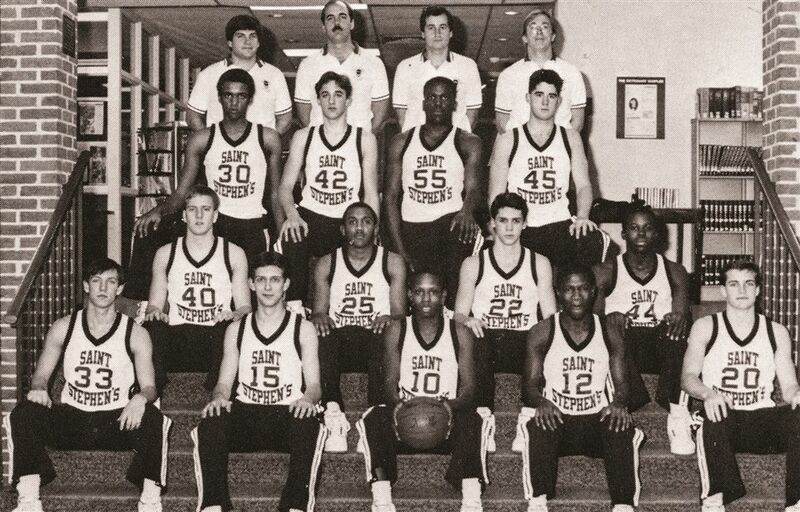 The 1987 St. Stephen's varsity basketball team was described by the school yearbook, "Scroll," as "simply awesome" and the "one bright star as dependable as the sunrise" to pull the student body out of the gloom of winter. The team that year had only two returning starters but came together for a perfect regular season. They played to each player's strengths, despite role changes from the year before, and the term "Proud to be the Sixth Man" really rang true as they used their depth in almost every game to edge their opponents. Leading the team were senior co-captains, 6'0" Rory Perkins and 6'3" Orson Williams. Orson ran the offense averaging 20-points a game, while Rory, known as "Mr. Defense," handled the defense. Also contributing to the team's success was Alain Nana-Sinkam '87 who averaged 15-points a game, and Justin Palmer '88 who led the team in steals. The school's rivalry with Episcopal High School heightened throughout the 1987 season, and during the two games against Episcopal, school spirit and emotions ran high. During the first game, the lead went back and forth, until the end of the second half when St. Stephen's pulled ahead. During the equally exciting second game, the St. Stephen's team once again came from behind for the win. The composure and level-headedness of the players guided the team that night to their 12th straight win against Episcopal in five years. Head Coach Win Palmer, later selected as the Virginia State Coach of the Year, coached the team to a perfect regular season and undefeated play in the IAC, leading to the IAC Regular Season and Virginia State titles, as well as a final ranking of No. 8 by The Washington Post. Orson, Alain, and Justin received school athletic awards, and Rory, Alain, and Orson were selected to the All-IAC team.